The Rocky Mountain Biological Laboratory is great location to host your retreat, course or conference! 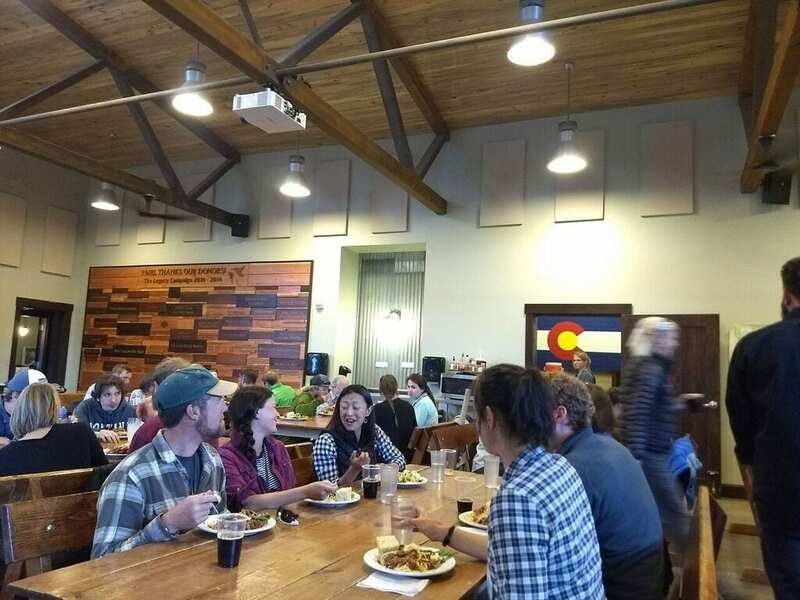 The billy barr community center is the perfect place for your group to meet, greet and dine amidst a well-known research facility within the historic mining town of Gothic located in the middle of the Colorado Rocky Mountains. In addition, we have break-out rooms, a computer lab, laboratory space, and housing in small cabins available to complete your meeting needs. Gothic is remote enough to get a back-country feel, but is also easily accessible to an airport and bus route 1 hour away. 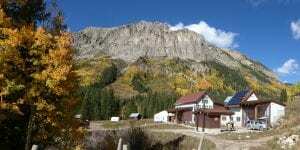 We are located 8 miles from the resort community of Crested Butte and 4 miles from Mt. Crested Butte. We are surrounded by miles of mountain biking and hiking trails, fly fishing streams and majestic mountains. RMBL can host large events, groups and conferences (more than 30 people) in September and October, subject to availability. In August, we may be able to host smaller groups of 6-30 people as our facilities are filled with students and scientists from late June to early August. RMBL is usually snowed in from mid-November to mid-May with access by ski or snowshoe only. Below, please find information about RMBL’s amenities available to all of our groups. Please contact Gesa Michel at admin@rmbl.org to check availability and to confirm rates. 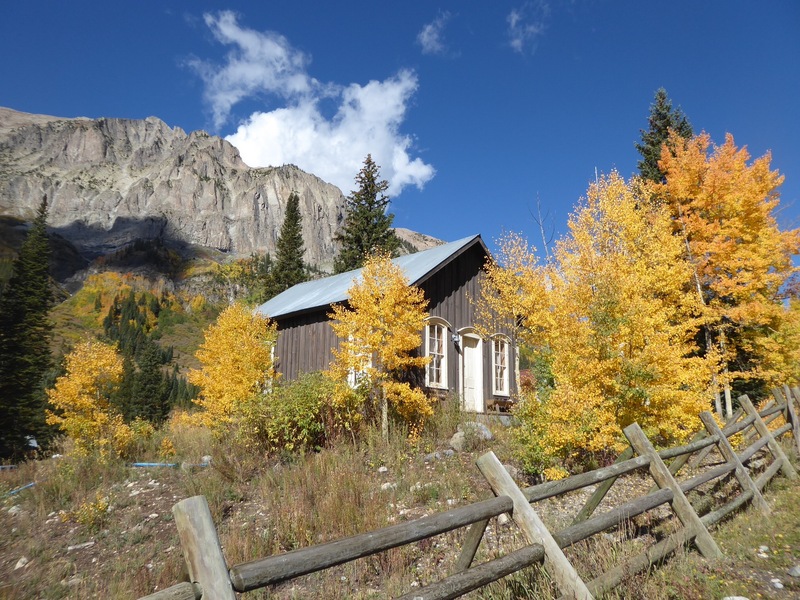 In the fall we can house 135 conference participants onsite in Gothic, with 60 available beds in premium or high-end cabins and 75 beds in mid-budget rate cabins. A range of options are available for off-site housing in Mt. Crested Butte and Crested Butte. Please visit here for more information. The main hall of the billy barr community center can seat 196 participants lecture style, or 128 participants seated for meals. Our conference/board room in the Community Center can seat 18 participants comfortably at one table. Two upstairs classrooms in the separate Barclay building each seat 30 participants lecture style and 18 participants in rows with tables. We have additional smaller break-out rooms available for rent. The main lecture hall (2,005 sq ft or approximately 50’x40′) offers seating for 196 comfortably (14 rows of 14). We can use partitions to adjust the space to fit smaller group sizes. There is a ceiling mounted projector and mechanical screen. Presentations can be loaded onto a resident computer with a flash drive. Alternatively, presenters can plug in their computer directly to the presentation system. Videos can be shown, as well as traditional PowerPoint presentations. There is a microphone for the speaker, with amplifiers throughout the room. Wireless access is available in the Community Center. Additionally, the billy barr community center has a small conference /board room (429 sq ft) with a conference table that seats 18 comfortably. During presentations the room seats 17 comfortably around the table for presentations with one table end being empty. The conference room has a wall mounted flat screen TV with Skype capability. A computer can be plugged into the flat screen for presentations. In the summers/fall RMBL has a 20’x30′ feet tent available for rent that sits on top of our outside 40’x40′ gravel pad which is included in the overall rental price. If a group would like to set up a separate tent, they can do so at their own cost. The group will need to inform RMBL at least 2 weeks in advance of the event and RMBL will charge the group a take-down fee at $40/hour. The Community Center seats 128 inside for meals, plus another 18 in the conference room. It is possible to set up more tables in the 20’x30′ tent directly adjacent to the Community Center to increase the number of people seated for a meal. However, because of the weather this is not advisable unless arrangements are made for a closed tent with portable heaters, at an added cost. We could price out a daily meal plan or individual meals (we serve breakfast at 7am, lunch at Noon, dinner at 6pm) and adding meeting amenities, such as coffee and snacks, please contact us for pricing. It is possible for up to 30 individuals to cook their own meals, using a combination of the domestic kitchen in the Community Center and facilities in the cooking cabins. Larger groups will either need to make arrangements for catering in the Community Center or plan offsite meals in Mt. Crested Butte or Crested Butte. Groups may rent the domestic kitchen separately from the Community Center on a daily basis. The domestic kitchen has four different cooking zones that serve four people per zone. If a group rents the entire Community Center use of the domestic kitchen is included. Groups larger than 30 will need to have all meals catered. Caterers must be approved by RMBL, though this involves no additional costs. The Community Center has two kitchens, a commercial kitchen and a domestic kitchen. Catering is done out of the domestic kitchen unless separate arrangements have been made. In the Barclay building – a separate building on campus – we have 2 classrooms that can each be set up with a projector and a screen. Classrooms seat lecture style ~30 (the maximum) in rows without tables, ~18 in rows with tables and ~12 in a horseshoe-shaped table facing a screen. The library – downstairs in the Barclay building also serves as a break-out room. It can seat lecture style ~25 in rows and ~ 15 in rows with tables facing a screen. Ruby Lounge, a communal cabin, and Town Hall, a prominent historic building in Gothic can also be set up as break-out rooms. They seat ~20 lecture-style and a mobile PowerPoint projector is available for use. RMBL has an open wireless internet system available throughout the campus, although some dead zones exist and coverage may not be dependable in all cabins. Excellent wireless access is available in the Community Center. There is no cell phone service in Gothic. If your group requires IT Support, it is free the 1st hour if a conference rental fee is paid. Otherwise, there is a $50 set up fee. Additionally, IT Support is at $50/hr, if: 1) The group is using Zoom; 2) Several people will video and/or desktop share at the same time; 3) The number of people or importance of the meeting dictates a higher level of support. Our housing stock has a mining town feel to it. Cabins are available for rent as part of your workshop or conference. From very rustic to highly comfortable cabins you have multiple options that will cater towards your group needs. Please read about the different cabin categories from Premium to Budget here. Smaller groups (less than 30) will rent the premium and high end cabins first, larger groups will have access to all cabin categories. The daily housing fee includes access to the internet, cooking facilities and running water at the Community Center and use of the Shower House. Individuals should bring a warm sleeping bag (rated to 20 degrees) and bath towel as RMBL does not provide sheets, blankets and pillows as part of the basic rate. A limited number of linen sets may be available to rent for a one-time fee of $50. A set of linens includes: a fitted sheet, top sheet, blanket(s), bath towel, pillow, and pillow case. Requests for linens need to be made at least one month in advance of arrival; we recommend that a request be made upon booking. If linens are reserved, they will be provided upon check-in. It can be very cold at RMBL in the fall; temperatures often drop below freezing both at night and during the day. We have approximately 60 housing spots in cabins that are well insulated, comfortable, and heated. We have approximately another 40 spots in cabins that are insulated and heated, though not quite as comfortable at colder temperatures. 35 spaces have very limited heat and insulation. We recommend that individuals staying in cabins with very limited heat bring warm sleeping bags and plan on spending most of their time at the Community Center or elsewhere. Cabins heated by electric space heaters will offer only a limited amount of comfort/heat, especially if they do not have insulation. If you are staying in a cabin with a wood stove you will need to be able to operate the stove. Instructions are provided in the cabin and we can provide help upon request. 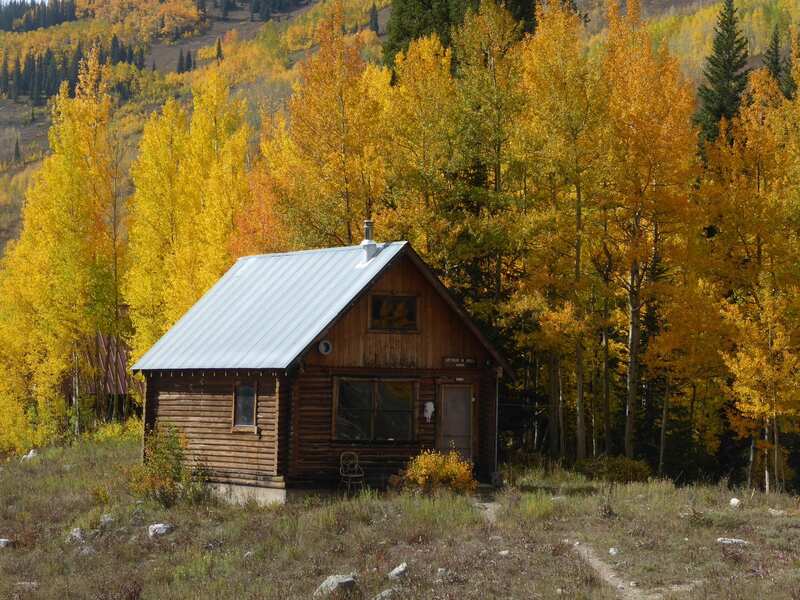 We have approximately 20 housing spots (assuming no couples) in cabins (Calder, Gates, Maroon, Richards, and Rogers Boggs) that have running water, good insulation and heat. We will not turn on water for minimal use because of the costs/time. Water in containers will be provided in cabins upon arrival, though residents will need to fill containers themselves if additional water is needed (water is available onsite). A Shower House with four showers and sinks is available for general use. Soap and shampoo will not be provided in communal showering areas, nor in cabins. Individuals will need to bring their own towels and soap for showering. Please note that there are only a limited number of showers. There are unheated outhouses (with no nighttime lighting) in proximity to all of the cabins. Bring a flashlight! There are a limited number of flush toilets onsite. A flush toilet may be available during fall season use in the Community Center, depending upon water availability. All event participants will need to check in at the Community Center between 2 pm and 5 pm on your day of arrival, unless prior arrangements have been made. We do not recommend that people unfamiliar with the site arrive after dark. Cabins will be available at 2 pm upon arrival and must be vacated by 11 am upon departure, unless alternative arrangements have been made. Participants will arrive on the same day and be available for an orientation led by RMBL for the entire group. This will make certain that people understand that they are surrounded by research– parking in designated spots, staying on paths, etc. The group will identify one contact person who is onsite whom RMBL staff can interact with during event. Participants are responsible for cleaning their cabins before departure. A cleaning charge of $40/hour will be billed to the program, if cabins are not properly cleaned. A check-out sheet is available in each cabin that outlines RMBL’s expectations. Participants are responsible for cleaning their own cabin during their stay (no maid service). RMBL also reserves the right to recover any damages to the cabins. A range of options are available for off-site housing in Mt. 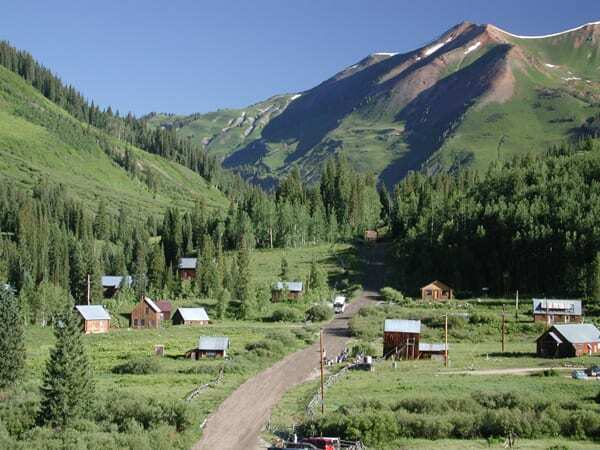 Crested Butte and Crested Butte. Please go here for more information. 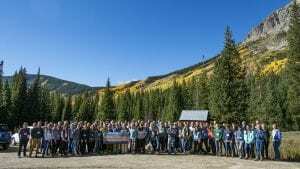 Conference participants can fly into the Gunnison/Crested Butte airport, which is approximately one hour away. Other regional airports include Denver (4-hour drive), Colorado Springs (3.5-hour drive), and Montrose/Telluride (2-hour drive). Alpine Express (http://alpineexpressshuttle.com/aexwp/) can provide transportation between RMBL and the airport. For more information, click here. Parking is free after August 24 but participants will need to park in designated parking lots only. For more information, go to: Parking. Website/Online Registration: RMBL can set up a conference website including online registration for a one-time fee of $1,000, which covers the staff time for setting up the website as well as the cost of taking payments through PayPal (3.5% of all revenue). RMBL will provide content concerning onsite facilities, recreational and site-seeing opportunities, offsite housing and restaurants, as well as post any additional information provided to us about the conference. As part of this service, RMBL will handle all finances. Conference Planning: RMBL can provide assistance with conference planning, beyond managing onsite registration, onsite housing and access to onsite facilities. If you would like assistance with managing off-site housing, participant transportation, non-RMBL field trips or other logistical items, please contact Gesa Michel admin@rmbl.org. Field Trips: Field trips can be arranged with the price depending upon the length of the trip and transportation costs. Microscopes: RMBL has microscopes available for use for a $15/microscope fee. 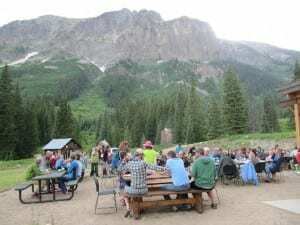 Winter Groups: We do not host groups after November 1 because the road typically closes in November and because of associated avalanche danger. Winter travel is subject to RMBL’s Winter Travel Plan. Because avalanches cross the road in winter, access is weather dependent and mechanized winter transportation is not allowed except in exceptional circumstances. Deposit: A deposit of $10/person will be required to hold housing spots. A deposit of $1,000/day is needed for the rental of the campus, which includes the Community Center. The deposit is non-refundable. Registration Fee: Individuals staying onsite will need to pay a one-time $25 registration fee per person or family. Payments: If you are making payment to RMBL as a lump sum, payment will need to be made at least 7 days prior to the start of the event. If individuals are making payment through registration on RMBL’s website, payment will need to be made when participants register. Cancellations/Refunds: Deposits will not be returned. 50% of the total fee is due for cancellations made less than 7 days before the scheduled arrival. A charge of 100% of the housing fee will be made for cancellations made less than 24 hours before the scheduled arrival, or for early departures. Insurance: Group will need to provide insurance for participants in the program and provide RMBL proof of such insurance in order to reserve and use housing spots. Liability Waiver: Each participant will need to fill out a RMBL liability waiver and an emergency contact form in advance of arrival. Pets are not allowed at RMBL. The RMBL campus is smoke-free, and there is no smoking allowed within the RMBL fence-line. Smoking is allowed on the county road only. Please visit the corresponding pages for more details and to view Rate Sheets for your specific group type. If you would like to bring a course or do a workshop related to Research and Education in June or August, please click here. If you would like to bring a group in September or October related to Research and Education or if you are a non-profit organization, please visit here. If you would like to host a wedding or bring a group from a corporation in September or October to Gothic, please go here.